The iPad generation 2, which many Apple watchers are calling the iPad 2, has received much attention from public since it's release. The next generation of the Apple iPad 2 features a high-resolution Retina display, powered by a dual-core graphics chip. The high-resolution screen and faster GPU would allow the iPad 2 to play 1080p HD video, The new graphics chip inside packs four times the processing capability of the A4 chips in current iPads, (Verizon) iPhone 4 and Apple TV. However, iPad 2 still plays achingly few video formats. And if you are thinking of buying an iPad 2, you can hardly wait to watch your favorite videos with it. 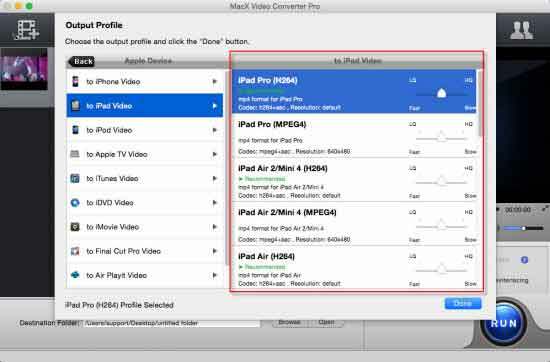 The following guide will show you how to covert MKV, M2TS/MTS, AVCHD, AVI, FLV, WMV, 3GP, RM, RMVB, etc video to iPad video MP4 on Mac and put video onto Apple iPad 2. By taking advantage of Intel's Quick Sync Video/Nvidia/AMD GPU hardware acceleration tech, it's the world's fastest iPad 2 video converter which is 5x times faster than other software! No.1 fast video converter for iPad 2 to convert MTS, MKV, MP4, AVI, FLV etc in 4K UHD/HD 1080P/720P to iPad 2/mini 4/Air 2/Pro and more with 5x faster speed than others! After download the iPad 2 video converter, install and run it. Click the "Add File" button to import video files that you want to watch on your iPad 2. Select the output video you desire. In this tutorial, we choose "to iPad". 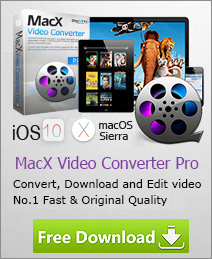 This video converter for iPad supports all types of iPad, including iPad 2. So if you are iPad 2 users, select "to iPad" is also available for iPad 2. This iPad 2 video converter is also an ideal tool for iPad/iPad 2 users to download a variety of online videos, music, songs, movies, TV shows in excellent quality to iPad/iPad 2 compatible video and audio formats, MP4, H.264, MPEG4, MOV, etc. Here comes another easy way to convert video to iPad - MacX MediaTrans, which provides one-stop solution to convert and transfer video to iPad 2/Mni 4/Pro/Air 2 on Mac speedily with no quality loss, thanks to its built-in video converter. It can auto convert video of 720P HD 4K MKV MTS FLV etc. to iPad 2/Mini 4/Pro/Air on Mac during the video to iPad transfer process, requiring no extra video converter download or iTunes transferring. Free download the Mac to iPad converter & transfer (macOS Mojave supported) and run it on Mac computer. The iPad video transfer for Mac introduced here supports to save video to iPad Pro/Air 2/Mini 4, all iPad generations. Step 2: Click "Video" icon on the main interface to start converting and transferring videos from Mac to iPad 2. Step 3: Click "Add Video" button to import the target video from Mac to iPad. If the video is not compatible with iPad 2, it will give "Unsupported format" message, click "Convert" button to convert video to iPad 2 on Mac. Then press "Sync" button on the lower right corner to finally save videos to iPad.